You have the opportunity to contribute your change management experiences to the largest body of knowledge in the discipline. 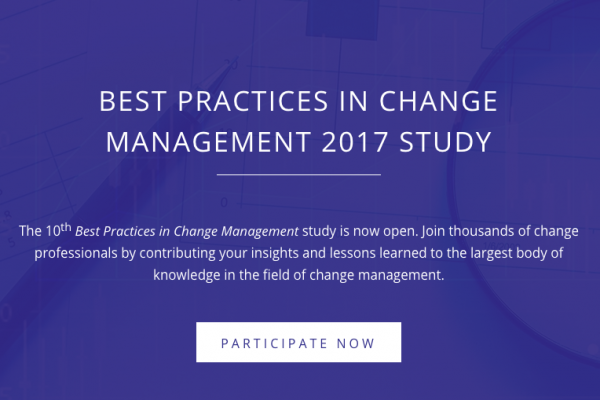 Prosci has been conducting change management benchmark and best practices research for nearly twenty years, and recently launched their 10th Best Practices in Change Management study! The study is not methodology-specific, so anyone with experience leading the people side of change is encouraged to contribute their insights and lessons learned. In return for your time and input, you will receive access to the published data through a one-year subscription to the eBest Practices, the cloud-based collection of Prosci’s research that allows you to access data from anywhere in the world. The study will be open until May 29, 2017. Go to www.prosci.com/study to get started today!